Mohamad was born to Palestinian refugees in the United Arab Emirates. His family was under the constant threat of deportation back to the refugee camp in Lebanon where they had come from. His parents, lacking strong educations themselves, could not help Mohamad with his school work, but always served as his role models and inspiration. At UC Irvine, he worked on building diagnostic devices for rural areas by designing computers that run on air instead of electricity. Later, he investigated the robustness of bacterial genetic circuits with respect to noise. Recently, Mohamad received the National Science Foundation Graduate Research Fellowship, recognizing him as one of the future leaders in his field. Mohamad is now pursuing a PhD in bioengineering at Caltech. The long-term goal of his scientific career is to develop tools for non-invasive modulation of brain circuitry, which would allow scientists to understand and treat neurological and psychiatric diseases that involve the dysfunction of local neural circuits. Biography by Mohamad Abedi as posted in the Paul and Daisy Soros Foundation’s Meet the Fellows section. What was your major at UCI, and how did you learn about the SOROS and the NSF? When I first transferred from Irvine Valley College to UCI, I wasn’t really sure of what I wanted to do. I was leaning, mostly, toward medical school. But, as I took more classes, I realized I really enjoyed physics and chemistry classes, which led me to think that if I went to medical school I wouldn’t be able to focus on these topics. I decided to come into UCI as a mechanical engineer major and transferred into that field. Then, I had another change of plans and ended up majoring in biomedical engineering. This way, I could also satisfy the part of me who wanted to be a doctor. How did I hear about the SOROS fellowship? When I was at UCI, I worked in a couple of labs doing research. I remember talking to professor Chang Liu and Elliot Hui about applying to graduate school and they recommended that I apply to fellowships and talk to other graduate students about options. I learned about the NSF and I also learned about the SOROS fellowship through them. Did you visit the SOP office? I did, when I wanted examples of NSF essays. Tell us about the SOROS. How did you write a competitive application and sell your case? The SOROS is a unique fellowship. I would say that they are looking for funding people as opposed to funding ideas. The NSF funds you based on an idea, mostly. 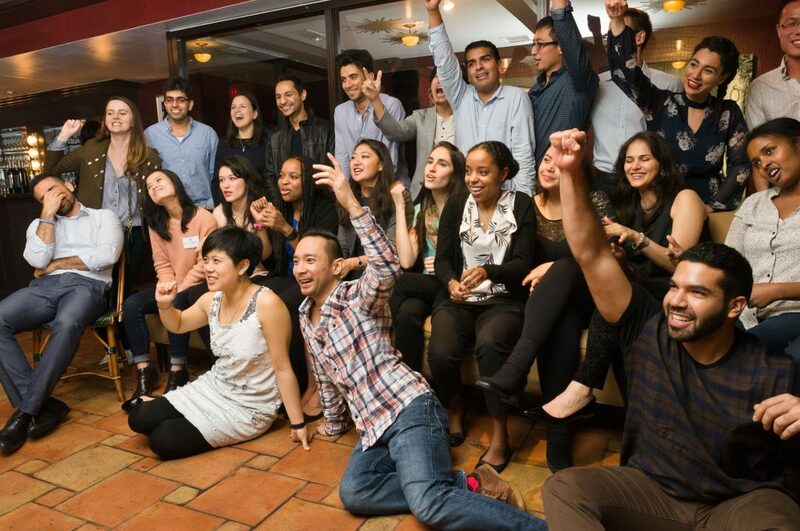 When it comes to the SOROS fellowship, you have to be an immigrant or the son or daughter of an immigrant. However, what they really look for is more than an immigration story. They want you to show that you are a person who holds great potential to contribute to the United States as an immigrant. They also want to learn about the certain ways in which the United States helped you. In short, in the telling of this story, they want to know that the help an immigrant student received in the United States was life-changing and would not have been possible anywhere else. They also want to attract students who have a clear path to becoming future leaders in their fields. What is your immigrant story? Where is your family from? It’s complicated. My family and I are Palestinian refugees.I came to the U.S. as a teenager. I was 17. In the beginning, I stayed with my aunt. A bit later, my sister joined, who is younger than me. As we got more financially stable, another family member would join. My family followed me later. As a virtue of being a refugee, we lived in Lebanon and we applied to come to the US. It was a very long process and toward the end, we got accepted to emigrate here. How did you craft your story? The SOROS looks for students who value the US Constitution and demonstrate potential for creativity and leadership. What did you tell them that you wanted to do with your life? One major factor in my case as a refugee was that in other countries, I always felt I was a second-class citizen or even lower. In these countries, we didn’t get a lot of opportunities. This was totally different when I came to the U.S. Here, I was treated as a U.S citizen, even though I wasn’t one at that point. I was given a lot of opportunities here to be creative and to focus on school. One of the most important benefits was that the US allowed me to be involved in research, which is an opportunity I wouldn’t have received anywhere else. The incredible opportunities I was given in the U.S. have been a major part of my story, and have influenced the path I pursued, and continue to follow today. 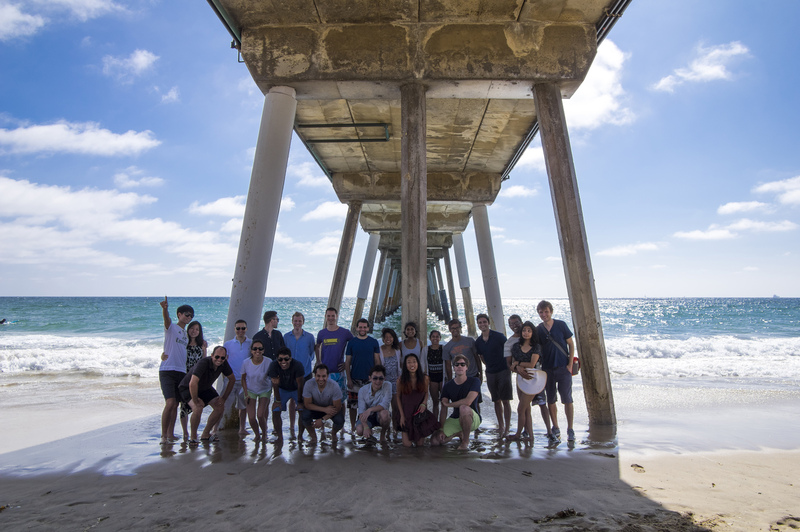 Mohamad and lab partners at Caltech enjoying a day off. How did the SOROS connect with the NSF project and what did you do for the NSF? Between applying to the SOROS and the NSF there was a year. When I applied for NSF I was still at UCI. The project that I proposed then was inspired by the research I had done as an undergraduate student. But when I started graduate school I started pursuing a different project. The one that I proposed for the SOROS fellowship was mainly focused on engineering cells in the brain, a project that was linked to the brain initiative launched by President Obama. Tell me about the brain initiative that President Obama proposed. A couple of years ago, the President directed funding of a billion or more (it is roughly half a billion per year and it has been going since 2013) to research the human brain. President Obama launched this initiative referencing that we understand the galaxies around us better than we do our brains. The White House wanted to pave the way towards understanding the brain by driving research towards developing new tools to study the human brain. What graduate school are you attending? I am pursuing a PhD in Bio-Engineering at Caltech. I didn’t go too far. I like it here. I’m in the middle of my 3rd year. Recently, I published a paper that details my work and what I’ll work on in the future. I’m working on developing proteins that respond to temperature changes. We are creating medicinal proteins intended to heal the body. Currently, people use light to communicate with brain cells, specifically, with neurons. The problem is that to get the light into your brain you have to drill a hole in your skull. The alternative is that you can use ultrasound to focus on a specific region of the brain and heat it without damaging the brain cells. But you also need a receiver that you can install in your cells so that they can respond to heat signals and that is where my work comes in. Through the use of an ultrasound, you don’t have to drill and the light reaches within the brain. What advice would give a student considering the SOROS and the NSF? If you are in a STEM field, participate in research. In my case, I ended up liking it so much that I changed my career to be a researcher, which was not my initial goal. Through the process of research, you start learning to be independent; you learn how to solve problems. Then, if you decide that research is what you want to do, fellowships become important because you can otherwise be limited to work on projects that a professor is working on, especially when the funding is coming from that professor. On the other hand, if you have a fellowship, like the NSF or the SOROS, you have more freedom of choice regarding which school, which lab and which project you want to work with. It gives you a lot of freedom to do what you care about, which is the biggest plus you get out of these scholarships. This is the case for the NSF. What is unique about the SOROS is that they really care about people, which is not very common for other fellowships. When you become a SOROS fellow, they fly you every year, for 2 years, to New York where you get to meet with other fellows and discuss major issues with them. You meet people from a lot of different fields. I got to meet musicians, people that work in the business field, people who work in clinical medicine, and many others. It is a great opportunity to meet all these different people who come from all these different fields. All of us have something in common. 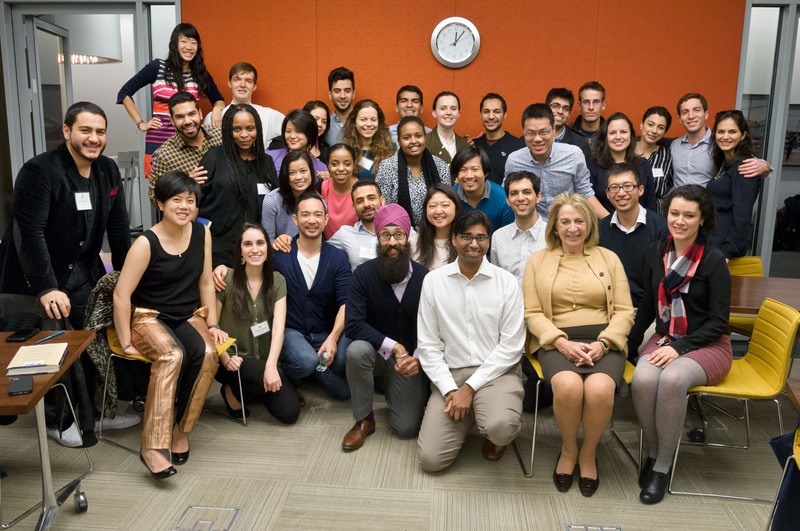 We all came to this country as immigrants, and we are all more or less on the path to help advance the field that we are in in this country, which is something really nice and I don’t think could be possible through any of the other fellowship. How many years have you been flying to New York to meet with the SOROS team? I’ve been a SOROS fellow for 3 years, and they pay for your expenses to go to New York and stay there for a weekend. 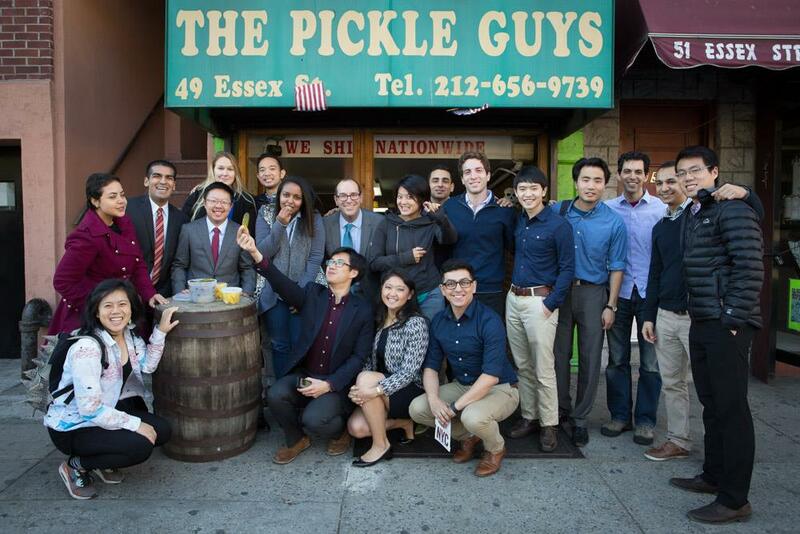 It’s usually a combination of fun activities, skill-development, and networking. The aspect of making connections is very nice. The year before, the U.S. Surgeon General, who is also a SOROS, sat with us and we got to discuss health issues affecting Americans. These are incredible opportunities to meet people that you would otherwise not have the opportunity to meet. These conversations allow you to meet amazing people on a personal level, interact, and build connections. They book us all in one hotel; they plan every day and they have a schedule, including food, workshops, and talks. How big is the group? The way it works is that every year they invite the class that won the fellowship that year and the year before so that’s why I went last year and the year before. Next year, I won’t get a paid invitation. I will have to pay for it myself, but every 10 years or so they have a big conference where everybody is invited. Paul & Daisy 2015 class in the New York Times! How does the SOROS conference appeal to the distinct fields? What do you have in common besides being immigrants? What we all share in common is that regardless of your discipline, SOROS recipients are ambitious, self-driven people who are goal-oriented. They have tall plans and are working to achieve them. These traits, we all share in common, and we appreciate them in others, regardless of the field. There is a very strong networking component to the SOROS. What countries or world regions are represented in your class? A big variety: Middle East, Iran, Egypt, in my case, United Arab Emirates, Europe, Eastern Europe, Asia, China, Taiwan, India, South America. What did you have to do to apply for the SOROS? You write 2 essay. One, of your work and your plans for the future, and the other, is about your American experience, your immigration story and why U.S. values are important to you and how you have used those values and opportunities to charge ahead. Once you send this in, if you are selected, you attend a personal interview, either in New York or LA. They fly you there, and you are interviewed by previous Soros fellows and other people. When I interviewed, the panel had previous SOROS winners and the Mayor of L.A. was one of the people who interviewed me. From the 70 candidates, they pick 30 to win the fellowship. What was the interview like? What questions did they ask? You go through 2 interviews. Each interviewing committee has 4 or 5 interviewers. Questions include: which research are you working on; what do you do in your free time; what’s important to you, other than work. They are looking for certain type of people. They really want to find out who you are as a whole. They tailor questions based on your background, and they are really interested in understanding your goals and they ask you lots of personal questions. Yes. They asked, “you told us about your research, you are busy all the time, but do you have something else in your life or do you only do research?” This is the point where they look to see if you are a well-rounded person and that question surprised me. I told them, I do spend most of my time in lab because for me the lab is fun. It never feels like an obligation. Some people find fun in sports or movies which I do participate in. But for me, working in the lab and interacting with my colleagues is fun, and what I do for fun. What sense did you get from the interview process? What are they looking for? They really want people who are showing strong potential in whatever field they are in. They don’t really care about specific types of research. What they care about is that you are a person who in the future will make the fellowship’s name and reputation more prestigious. The more successful you become, the more prestigious the SOROS becomes. They look for the people who have the potential to become successful, to become leaders in whatever they are doing. It’s not enough to have an immigrant story. It’s important to show how that story affected you and informed the person that you are today. And if that person shows promise, then that’s the person they want to keep as a SOROS fellow. How has the SOROS process changed you? I think the biggest advantage, other than the money, is the amazing people I would have never had the chance to meet in my life. These meetings give you new perspectives. They inspire you because they show you what other people are doing with this opportunity and their personal drive. We help each other out to reach these goals. We encourage each other to stay motivated, to stay inspired and to stay connected. What would you tell a student who is preparing to apply for the SOROS. What should they definitely cover in their essays? Show that being in the U.S. has helped you become the person that you are. Connect your story to how these opportunties have developed a patriotic spirit for the U.S., that you are on the path to success because of the U.S. and in turn, your success will help the U.S become a better country. The SOROS is a patriotic fellowship that is interested in making this country better. They want to see people who have the potential to be successful so in the application and interview it is important to focus on the bigger picture and demonstrate that what you are working on could be useful and impactful for the country as a whole. Show them that you have a clear path of where you want to be in the future. They don’t want people who are unsure. They want people who have a goal, are driven and know what they need to do to reach that goal. How did you convince them that you are going to be successful? What are the values of America that you love and that push you to be the best that you can be? How will you give back and be a contributive member of U.S. society? The first question relates to the American dream. It doesn’t matter where you come from. It doesn’t matter who you are. If you put in the effort and the work, opportunities will be open to you and you will be able to reach what you want. In other countries, in order to be successful, you have to come from a big family name, or you have to be rich. Over here, when I came to the U.S. my name didn’t mean anything and I wasn’t financially in a good place, but because I was putting in the work and I had a vision, doors opened for me, either through fellowships, scholarships, or assistance. Doors will be open to you to reach your goal as long as you put in the work for it. The second part, how I convinced them that my project will be impactful, it is very important to have strong letters of recommendation. I can talk all day about who I am and what I plan to do, but it is through the letters verifying that, that the committee can start to see it. When professors write letters making comments like, “I know this person; I’ve seen his work; I know that he will be x y z in the future,” this is really important. And in my case something else that helped me during graduation from Irvine, was that president Obama during his commencement speech, one of the people he mentioned was my name, Mohammad Abedi came as a refugee and now he is working on his Ph.D. getting an endorsement from the president, saying I got here as a refugee and now he’s going to do great things, helped me a lot in my application for the SOROS. How did President Obama learn about you? When the president decided he was coming he had people contact UCI for recommendations. He wanted to mention names. They asked people for profiles and biographies and sent them back to the White House and the White House contacted me a day before to verify information. They said there is no guarantee that he is going to talk about me. When I went to the graduation, I wasn’t even sure. It was great when he mentioned my name. Any other advice you’d give students thinking about fellowships? It isn’t only about the grades. Doing research is important, learning how to be a good writer is important. Also important is to seek help, ask for help. There are a lot of nice people who have a lot of information and are very willing to help, but you have to seek them out. Be active about the things that are important. When I wrote my application, I sent it to tons of people; whoever was willing to read my application. Many people write their applications and they are either shy or they don’t want to share it. Get as much feedback as possible. What is next for you? What do you want to do after you get your degree? I’m working on completing a Phd so I can start a career as a tenure-track professor. I would love to stay in California. I love the weather here. Follow this link to learn about his latest research. To find out more about Mohamad and his partners in Shapiro lab, click here. 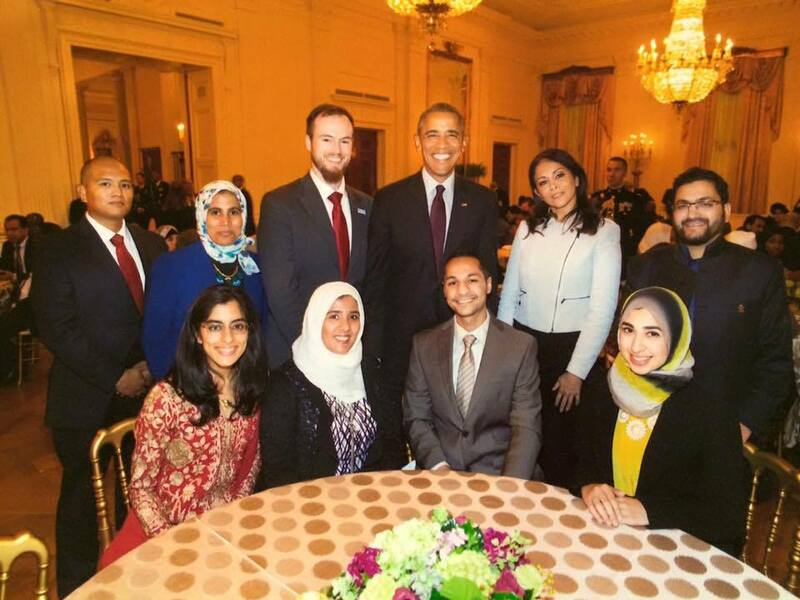 President Obama mentions Mohamad’s accomplishments during his commencement speech. Copyright © 2009 Scholarship Opportunities Program. All Rights Reserved.